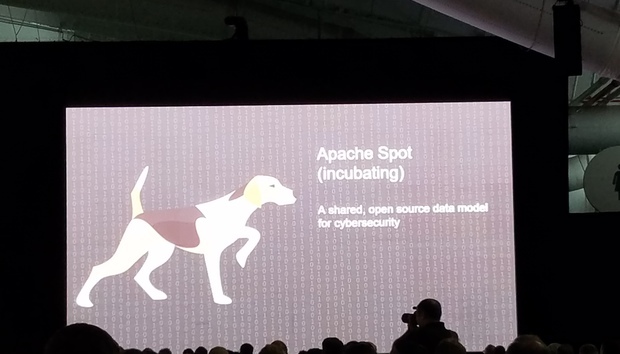 Hard on the heels of the discovery of the largest known data breach in history, Cloudera and Intel on Wednesday announced that they've donated a new open source project to the Apache Software Foundation with a focus on using big data analytics and machine learning for cybersecurity. "The idea is, let's create a common data model that any application developer can take advantage of to bring new analytic capabilities to bear on cybersecurity problems," Mike Olson, Cloudera co-founder and chief strategy officer, told an audience at the Strata+Hadoop World show in New York. "This is a big deal, and could have a huge impact around the world." Based on Cloudera's big data platform, Spot taps Apache Hadoop for infinite log management and data storage scale along with Apache Spark for machine learning and near real-time anomaly detection. The software can analyze billions of events in order to detect unknown and insider threats and provide new network visibility. Essentially, it uses machine learning as a filter to separate bad traffic from benign and to characterize network traffic behavior. It also uses a process including context enrichment, noise filtering, whitelisting and heuristics to produce a shortlist of most likely security threats. By providing common open data models for network, endpoint, and user, meanwhile, Spot makes it easier to integrate cross-application data for better enterprise visibility and new analytic functionality. Those open data models also make it easier for organizations to share analytics as new threats are discovered. Other contributors to the project so far include eBay, Webroot, Jask, Cybraics, Cloudwick, and Endgame.